The Annual East Clandon Village Fete is held in the grounds of Home Farm, Ripley Road, East Clandon during the afternoon of a Saturday in June, commencing at 2.15 p.m. Among the attractions on offer are two tombolas, face painting, wet the wally, football games, golf games, western bar, darts, toys, books and videos, home-made produce, bric-a-brac, treasure hunt, rolling balls, coins in a bucket, splat the rat, smash the egg, bran tub and many other stalls. 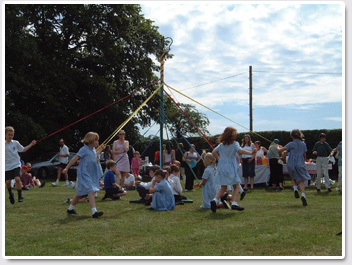 Live music is provided and entertainment from the maypole dancers from Clandon School. F.R.O.S.T, one of our village charities supervises train rides on the 'Funtime Express' for scenic trips around the paddocks. Refreshments are available in the form of delicious home-made cakes, cups of tea, Pimm's, locally-brewed beer and soft drinks. Ample parking spaces are available in fields along the Ripley Road. The fete usually attracts between 400 - 500 visitors and all proceeds go to three of our village charities: Cherry Trees, the Parochial Church Council and the Village Hall.